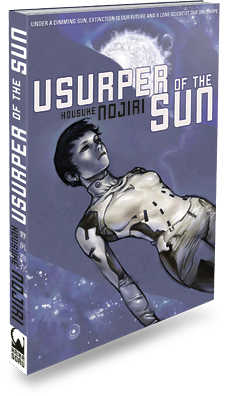 ﻿ USURPER OF THE SUN « Haikasoru: Space Opera. Dark Fantasy. Hard Science. Aki Shiraishi is a high school student working in the astronomy club and one of the few witnesses to an amazing event--someone is building a tower on the planet Mercury. Soon, the Builders have constructed a ring around the sun, threatening the ecology of Earth with an immense shadow. Aki is inspired to pursue a career in science, and the truth. She must determine the purpose of the ring and the plans of its creators, as the survival of both species--humanity and the alien Builders--hangs in the balance. Born in Mie, Japan in 1961. After working in instrumentation control, CAD programming and video game design, he published his first work, The Blind Spot of Veis, based on the video game Creguian, in 1992. He gained popularity with his subsequent works, the Creguian series and the Rocket Girl series. In 2002, he published Usurper of the Sun, ushering in a new era of space science fiction in Japan. After first appearing as a series of short stories, Usurper won the Seiun Award for best Japanese science fiction novel of 2002. His other works include Pendulum of Pinieru and Fuwa-Fuwa no Izumi. Two hours after the convergence of probehound and ship, a kilometer-wide gap between the severed edges of the Ring glistened in the sunlight like two giant fluorescent light bulbs standing on end. Since the Ring was no thicker than a sheet of aluminum foil, the bright edgewise shine was proof that some process was under way. It’s Tuesday and we have two of everything! And the translator, unlike the author, cannot simply do wholesale rewrites to make something work. We’re playing a hand that has already been dealt. Then there’s the issue of translator skill; few have the ear of a novelist. That’s when I come in. I’ve managed to find some excellent creative translators, but can also nudge and pull and yank and tug at the work. So far I haven’t had to put in any footnotes to explain this or that untranslatable term or cultural reference, though part of my luck there has been the immense cultural exchange between Japan and the English-speaking world over the past two decades thanks to video games, manga, and anime. …based on John Wunderley’s translation of Housuke Nojiri’s Usurper of the Sun, [Haikasoru] promises to be a fascinating program…The main provocative idea that Nojiri introduces here has to do with the nature of mind and perception, and what he calls the difference between adaptive and non-adaptive intelligence, but to say more would be to reveal the story’s most intriguing surprise. With that in his basket, a tightly focused narrative line that marches us relentlessly through 35 years of future history, and a genuinely engaging heroine, he’s acquitted himself well. Not only do we have two publicity coups, we have two new books out today! Here’s my shakeycam pic of The Book of Heroes out in the wild. Yes, sadly it is in the manga section and not either Science Fiction/Fantasy or Young Adult, so keep an eye out! And we also have Yukikaze hitting shelves today. Don’t have a snap of that book yet, but people are reporting buying it. This guy seemed to like it. I mean, he SHAT BRICKS. That’s positive, right? Quite busy today, so here are just some things for you to click on. That’ll be less exhausting than reading textbooks! Usurper is a mini-anthology of classic SF concepts: the logistics and physics of a Dyson structure and nanomachinery; the insignificance of life’s place in the universe, which science only makes more profound as time goes by; and the way a giant external threat could theoretically serve as a unifier for a divided mankind. The latter’s been explored in everything from Watchmen to Theodore Sturgeon’s short story “Unite and Conquer”. Arthur C. Clarke gets a nod on the cover blurb, and Nojiri’s spare, direct writing style brings to mind Clarke’s work (and Asimov’s) as much as the high-science subject matter does. This was great to read as, so far anyway, many of the reviews our titles have been getting have come from readers and critics very interested in manga and Japanese fiction. It was interesting to get some feedback from a reviewer very well-versed in Western SF. Somewhat related, here is an interesting article on the pitfalls of a company trying to bring Japanese fiction to a wider audience in the US from the Manga Critic. That’s all for today. See you midweek with some more substantive stuff. Now back to the comma mines!